While in Washington DC, I was invited by the amazing team at Soulex Float Spa to try floating. It was my first time floating in an acrylic saltwater pod and let me tell you, it was quite an experience! Don’t worry, you’re not alone! I was first introduced to the idea during the Blue Mind Summit in 2015 hosted by my dear friend and mentor, Dr. Wallace J. Nichols. Since that time, I’ve been curious to try it out. Floating is a unique sensory deprivation experience where you float in a pod or tank of super-saturated magnesium water that makes you completely buoyant (aka weightless!). 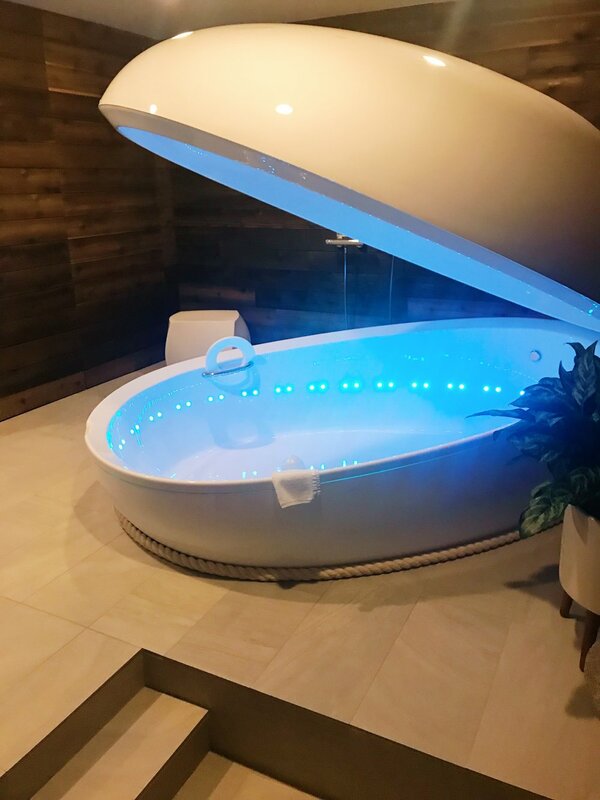 Float pods are essentially designed for short-term sensory deprivation. There are actually a ton of benefits to spa floating! Floating relieves physical pain. It oxygenates your body by encouraging better blood flow to your brain, organs, and limbs. Essentially, it minimizes muscular pain. Floating lowers stress levels too. The water’s magnesium blocks a hormone that drives your adrenal glands to release the stress hormone, cortisol. In addition, the sensory deprivation part of the experience minimizes stress. In a recent study, people who floated 8 times in two weeks saw their cortisol dropped by more than 20%! But that’s not all. Floating can also help with the reduction of anxiety and depression as well as improved feelings of well-being and focus. In fact, a total of 60 minutes in this floating experience is equivalent to six hours of meditation! It’s not hard to see why Soulex is phenomenal. It is DC’s first flotation and sensory deprivation center and they offer healing for the mind, body, and soul. The spa design is relaxing and sleek with modern touches added to the mix. Their rooms are completely private, providing a relaxing and enjoying experience. Created in Germany, Soulex’s floating pods are top notch. They really paid special attention to the design, presentation of space, and the entire customer experience. The friendly staff goes above and beyond to make sure you have a relaxing time, and it was absolutely wonderful! While you are in the water, you can either enjoy the silence or choose from 16 different sound tracks to help you achieve a rejuvenating floating experience. There’s even an option for aromatherapy. On top of that, Soulex is environmentally conscious and they strive to use eco-friendly, natural products. If you’re thinking of trying a float spa, I highly recommend it. To learn more about Soulex, visit their website at soulexdc.com.